In implants dentistry dentures are false teeth made to replace teeth you have lost. Dentures can be complete or partial. Complete dentures cover your entire upper or lower jaw. Partials replace one or a few teeth. 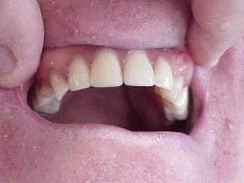 Advances in dentistry have made many improvements in dentures. They are more natural looking and comfortable than they used to be. But they still may feel strange at first. In the beginning, your dentist may want to see you often to make sure the dentures fit. Over time, your mouth will change and your dentures may need to be adjusted or replaced. Be sure to let our best dentist in Pune handle these adjustments. Removable Partial Dentures with cast metal frameworks are probably one of the oldest forms of dentistry. 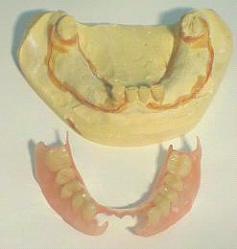 This type of partial denture offers numerous advantages. Since they sit on the teeth, as well as being attached to them, they are extremely stable and retentive. 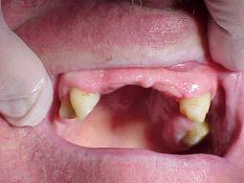 The teeth have been altered slightly beforehand in order that the partial denture can rest upon them without interfering with the way the patient bites the teeth together. The metal framework does not contact the gums. 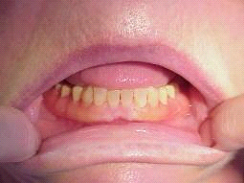 Thus, as the gums resorb, this type of partial does not sink with them and rarely requires relines. Because the teeth are altered by the best dentist in Pune beforehand, there are fewer limitations in the placement of clasps, and they are less likely to be seen than the wrought wire clasps of the treatment partial. Modern frameworks are cast from an extremely strong alloy called chrome cobalt which can be cast very thin and are much less likely to break than the all plastic variety. They are also much less noticeable to the tongue. The largest single advantage that cast metal framework partial dentures have over the newer flexible framework partials (covered below) is that sore spots are almost never an issue since neither the framework, nor the plastic extensions contact the soft oral tissues with any force! Patients who exhibit the symptoms of TMJ, or who are known bruxers are much better off with cast metal partials than with flexible framework partials. The most recent advance in dental materials has been the application of nylon-like materials to the fabrication of dental appliances. This material (the most common name brand is ValPlast) generally replaces the metal, and the pink acrylic denture material used to build the framework for standard removable partial dentures. ValPlast is similar to the material used to build those fluorescent orange traffic cones you sometimes see on highways. It is nearly unbreakable, is colored pink like the gums, can be built quite thin, and can form not only the denture base, but the clasps as well. 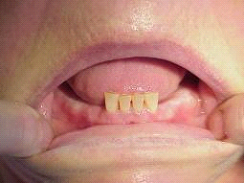 Since the clasps are built to curl around the necks of the teeth, they are practically indistinguishable from the gums that normally surround the teeth. 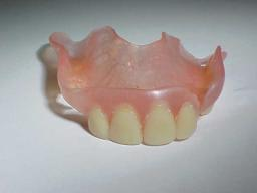 A second type of nylon partial denture base is a brand called Flexite. This polymer is also flexible and is built with tooth colored clasps, but unlike Valplast, it is much easier for the dentist to adjust making it a much more "user friendly" denture base. Even though this type of denture does not rest on the natural teeth like the metal framework variety, the clasps rest on the gums surrounding the natural teeth. This tissue, unlike the gums over extraction sites, is stable and changes very little over time which keeps these RPD's stable and unchanging similar to the cast metal variety. The clasps can be seen (if you look hard) on the image on the right below just under my thumb and index fingers. This type of partial denture is extremely stable and retentive, and the elasticity of the flexible plastic clasps keeps them that way indefinitely.